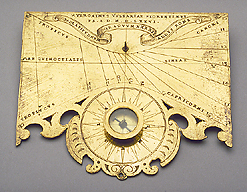 The pin gnomon dial, indicating Italian hours, is engraved on a brass plate, with three straight edges and a decorated one. A small compass is also mounted on the plate. Girolamo della Volpaia belonged to one of the later generations of a family of instrument makers in Florence, of which well-known members were his grandfather Lorenzo della Volpaia and his uncle Benvenuto della Volpaia.